Diary of a Design: Day 4, now we’re getting somewhere! I got a fair bit done yesterday, all the cables are completed and I’m on the Rev St st bit heading for the shoulders. I’m about 3 cm from the shoulder rise. Here it is lying on top of another design, Biennial, for comparison. There’s more ease in this new jumper, but it won’t show till it’s blocked. The armholes are a little lower for roomier sleeves too, but otherwise the backs are quite similar shapes. I’ve used nearly 3 balls for the back so far, so it looks like the whole jumper will be 12-14 balls to make. So, of course you’ve figured out by now that this design isn’t 5 days old. It started at Unwind in Brighton, actually, when I met Sonja from Blacker Yarns and got a ball of the lovely, lovely Elegance from her. I started swatching on the beach on the Sunday! This shade is silver, which is white with just a hint of black running through to give the grey effect. The yarn is not dyed at all and the various shades are made by spinning in the naturally coloured alpaca fibres. Corriedale fleece itself is always white and makes up 80% of the base. The addition of the alpaca makes the yarn smoother and softer. Overall it has fab bounce and I’m definitely enjoying working with it. 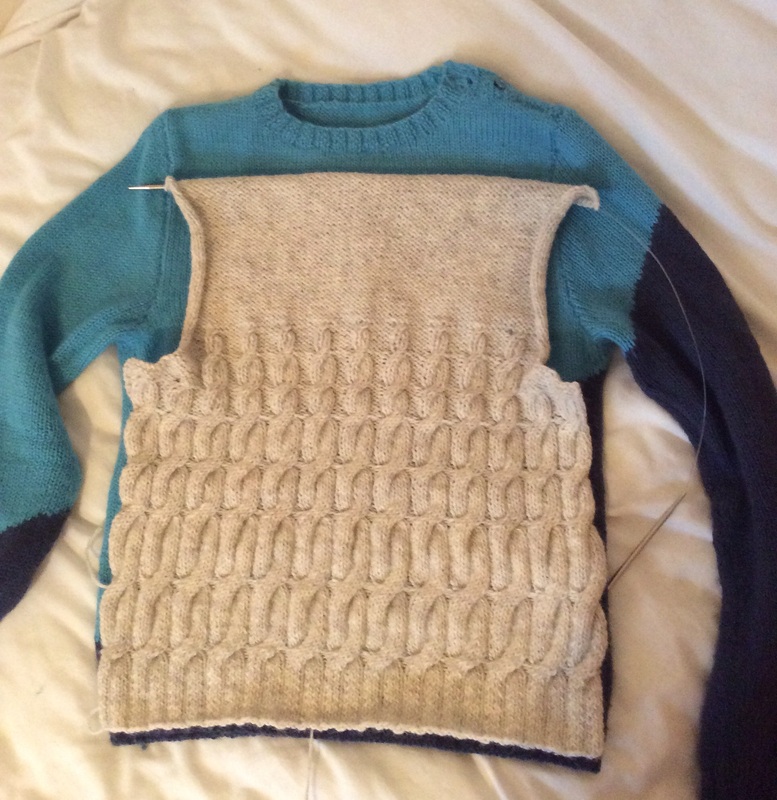 The jumper is going to be super-warm too. So a big thank you to Blacker yarns for providing the yarn support! The yarn I’m using is Blacker Elegance DK in Silver (pale grey). It is also available in a 4-ply weight and the natural colours are white, pale and darker grey, pale and darker brown. It sells at £6.50 per 50g ball of high-quality British yarn. Today’s Saturday, so I’m not sure how much knitting my young family will let me do today, I’ll be sure to keep you updated tho!